When Richard finds his neighbour dead, surrounded by images of Will Self, little does he know how his life is going to change. He's attempting to write a novel but his anti-pyschotic drugs are dampening his mind. He remembers a card that fell from Sylvie's pocket last time he saw her and follows the clue to discover a cult that worships Will Self. The prologue is incredibly random but made me smile in a word geek kind of way. After Richard discovers Will Self, his narrative starts to imitate him and I think the use of unusual words is a little over done. However we are not stuck with one narrative and I do wonder if those that slated the book read the whole thing. Richard reveals quite early on that he is taking clozapine, a drug used to treat schizophrenia, so you start to wonder whether it's all one big hallucination. The narrative then skips to Sylvie's ghost who is haunting Will Self. Then we go back to a diary written by Richard after a certain event has happened. The we skip to the future and we wonder if we are reading a book within a book within a book...and so on. I really quite liked the future part where Mia stumbles upon what could be a conspiracy. Where religions based on writers is the norm and instead of book to movie adaptations there's book to crime. Then finally the narration passes onto the author, but a different, fictional version. It's all a bit surreal and there are times when I had to stop reading because I felt I was losing my sanity a little. It seems to be a homage to Will Self. I haven't read any of his novels but I know enough about him to see his quiddity in the book. Quiddity being the essence of something, the defining features. I quite like the word and it is used quite a bit, probably more skilfully than some of the “big words” that are thrown around (or sesquipedalian to use the preferred term). It does however raise the questions of the evolution of language and how the world is becoming dumbed down. The cult itself is reminiscent of Eyes Wide Shut. If you like unconventional narrative structure or are a fan of Will Self, give it a go. It's certainly going to be a Marmite book, although unlike the yeast extract (hate) I am sat on the fence. There were bits I loved and some that were just too much. The characters go on about their genitalia a bit too much (I believe this is a Self thing) and I found myself tiring of their literary aspirations. 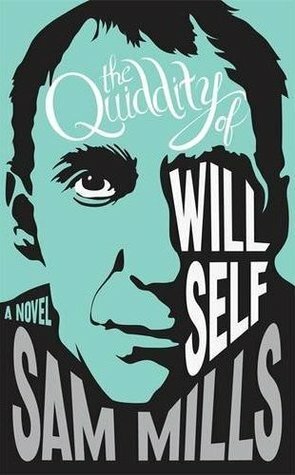 The Quiddity of Will Self is published by Corsair, an imprint of Constable & Robinson, and is currently available in hardback and ebook formats. Thanks go to the publisher for providing me with a copy of this bizarre novel for review! That sounds totally bizarre! But I guess with a title like that it's bound to be a little out there. Thanks for the great review - I do love Will Self so I'm very tempted by this. It sounds like a very weird concept! Think I might sit this one out for a bit! I've been interested to read this for a while. However, the more the hear, the more I think I'd do just as well to pick up a Will Self I haven't read.